Are you interested in helping spread the word about OWH? We've got a new email list we're gathering for those who would like to help out in this way. You'll need to be willing to do a little research - figuring out the stations and papers in your area that would be most likely to do a story on OWH, finding out who the editors/producers are, and pitching the story to them. We'll provide you with the resources you need - and help in confirming that you've found the right person. We'll provide a press release, any email templates you'll need, and a phone script if applicable, so you'll be well equipped to send the right info to the contacts. Edit your email list preferences and add "PR Team" to the lists you're on. We'll send info out through that list, and give you all the info you need. No harm, no foul! If you find that PR isn't your cup of tea, no problem at all. You can unsubscribe from the PR Team email list anytime. We've been asked to provide 201 "Welcome Home" cards for a unit returning in June from a year long deployment in Iraq. These are needed quickly, so we're aiming to collect them at our Washington location by May 15th. Please write your thank-you or welcome home note inside, just like in an AnyHero note. Leave a comment here with how many you're committing to do, so we know if we need to keep posting and recruiting assistance! 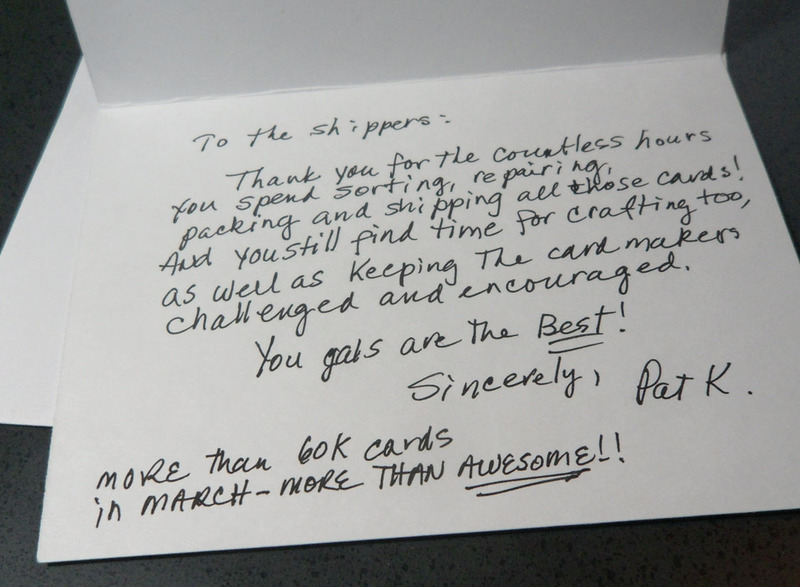 This week our shippers received, processed, stamped, tucked, and sorted 8,220 cards! WooHOO! Keep those cards and letters coming....we're on the way to our one million milestone! 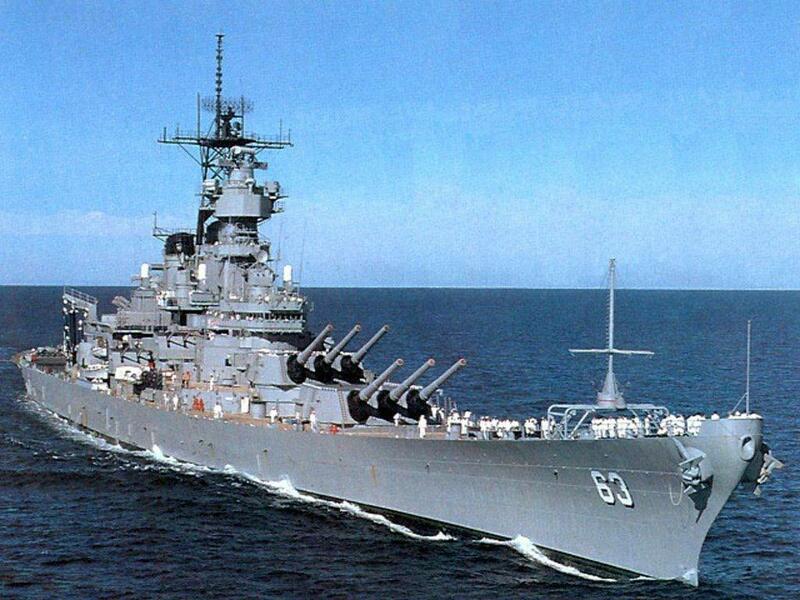 All our shippers are still in need of Father's Day and Dad cards - the latter are more flexible, since "Love you Dad" cards work for the holiday, or our heroes can write home on them anytime. Thanks for helping us get them cards to honor their Pop this year! *a side note: some of the stamp club names on this week's list are a hoot! Are you part of a stamp group? Have you named yourselves? 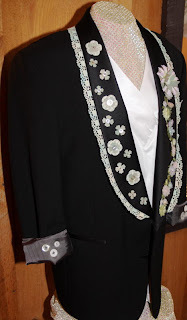 La Moda Lisa is currently holding a tuxedo jacket fundraiser, with the proceeds going to various charities. There are 16 jackets that were each created by a different artist with a particular charity in mind, and OWH was chosen as one. Those interested can place bids in their store, by phone or by email until May 19th, and the highest bidder wins the jacket. On this date the winners will be announced at an in-store Open House event where there will also be storewide sales on merchandise. The artist will receive 55% of the sale and the charity of their choice will receive 45% of the proceeds. 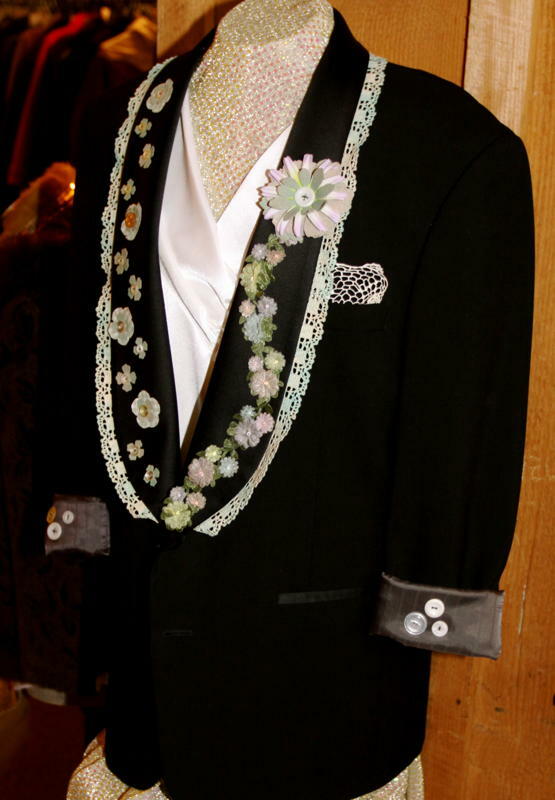 All are invited to visit the store anytime on or before May 19th to view the jacket created in support of your charity. La Moda Lisa is a new consignment shop located in a 6,ooo sq. ft. barn on Saratoga Road in Glenville, NY. 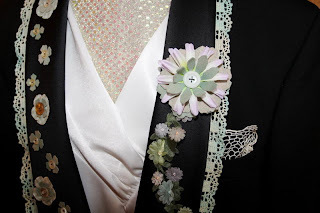 Go to the La Moda Lisa Facebook page where there is an album with photos of all the jackets. Bids can be made in the store, by phone at 518-280-1595 or by email at lisadurand@me.com. 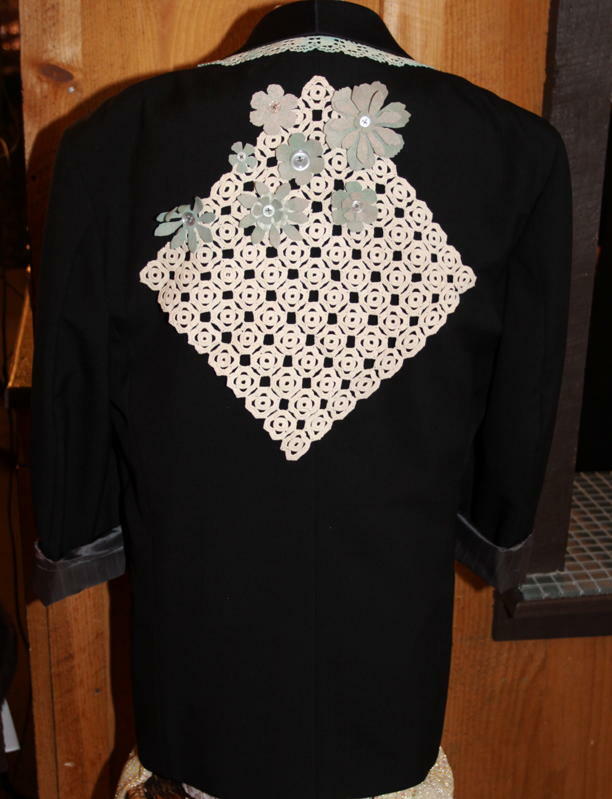 Many thanks to cardmaker Debb R who created this beautiful jacket to benefit OWH! This week 13,216 cards were mailed out - at a cost of $522.95! That's 41 boxes between all our shippers! We don't have much further to go til we pass ONE MILLION CARDS! Do you have a package of cards to send in to help us make that milestone quickly?? If you have a loved one or a friend stationed overseas, you know how much they appreciate greeting cards and letters sent from home. 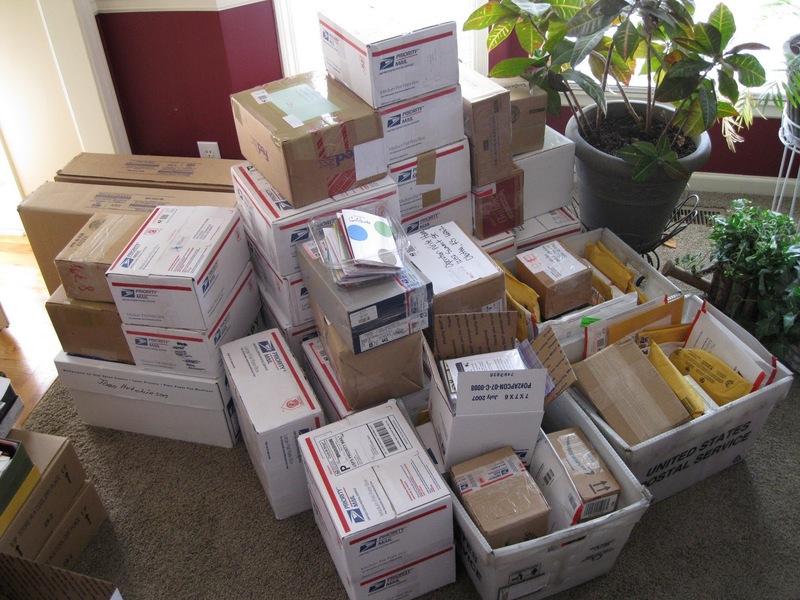 And there's no shortage of agencies and organizations that send cards, letters and packages through the mail to them. But, until recently, there was no one to help military personnel return the favor, to send cards back home to family and friends. Those engaged in military operations have little or not opportunity to pick up holiday or seasonal cards to keep in touch with family members. In 2007, Sandy Allnock heard a story about a woman in Texas who sent a box of greeting cards to her son so he and his fellow soldiers could send greetings home. "It was pretty much an accident that got me started on this," Allnock said. "I contacted many of my friends and we decided to start something." 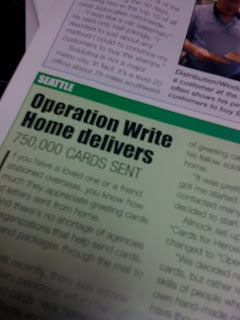 Allnock set up an organization called "Cards for Heroes," which was later changed to "Operation Write Home." "We decided not to use store-bought cards, but rather rely on the creative skills of people who could make their own hand-made cards," she said. 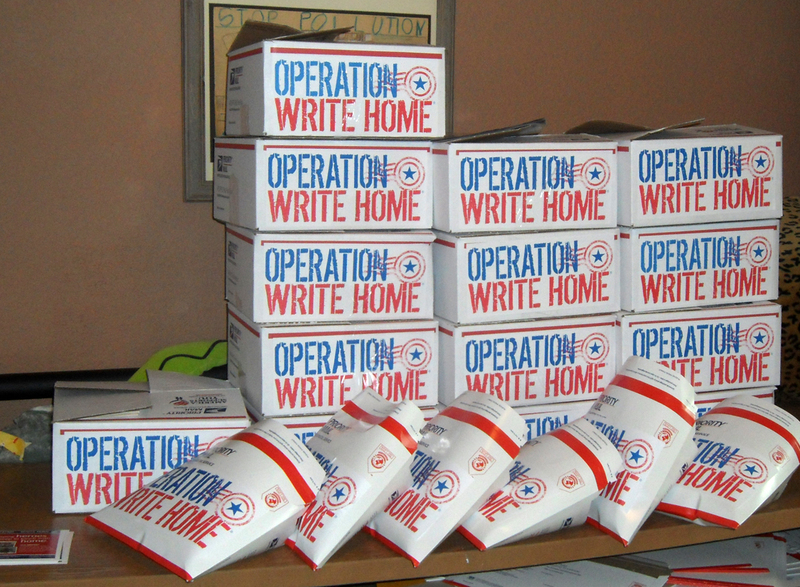 "We have thousands of volunteers around the country who make the cards and send them to us for packaging and mailing to the troops." 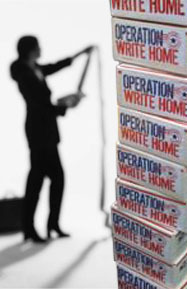 Operation Write Home's slogan is "Helping heroes keep in touch with home." Allnock lives and works in Federal Way, WA. About 40 percent of the cards are mailed from the Twin Lakes Branch Post Office in Federal Way. 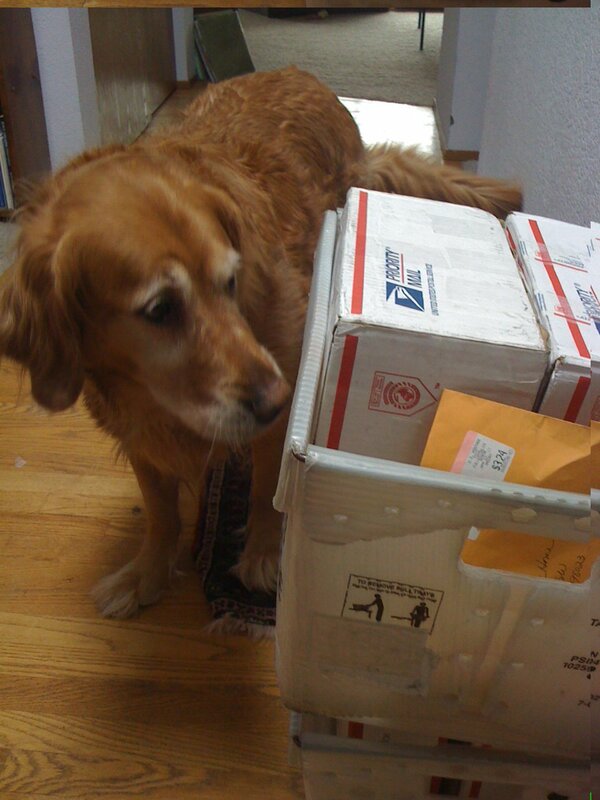 Another 30 percent are mailed each from Charlotte, NC and from Olathe, KS. "We love the Postal Service," Allnock said. 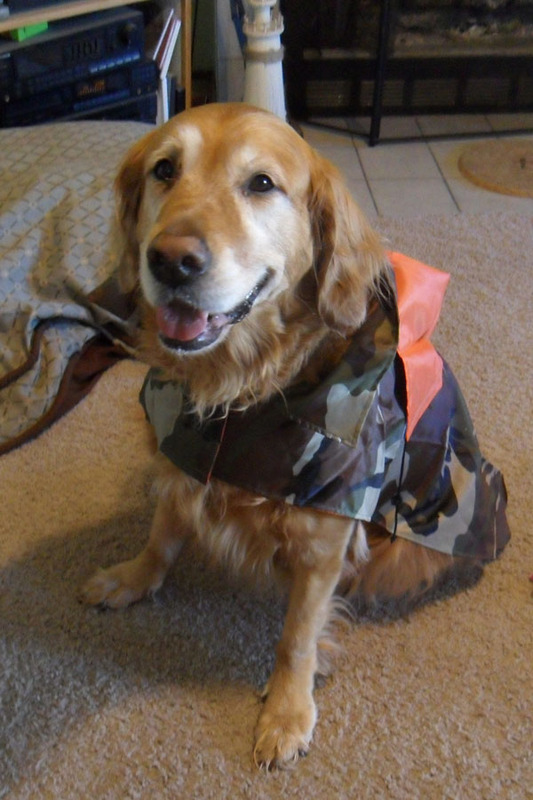 "We use the Priority Mail Flat Rate Boxes and get the $2 discount for mailing to military personnel. The free shipping containers help to keep our costs down." Each shipment also includes some "hero mail," letters addressed to military personnel thanking them for service to their country. 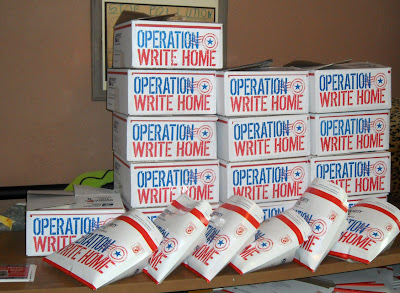 Last year Operation Write Home sent about 1,440 boxes of greeting cards overseas. Each box contains 325 to 350 cards. Donations come in from around the country to pay for postage, which amounted to more than $18,000 last year. The organization has a webpage and also relies on social media to get the word out about their efforts. I'm doing a little research for a project, and need some help determining what would make a good scrapbook kit. Not a card kit. 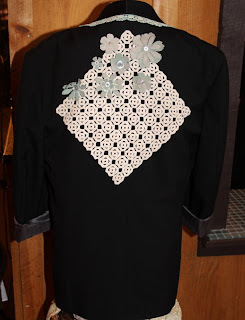 I'm consulting on a project for someone, and am coming to the crafty experts I know: YOU! 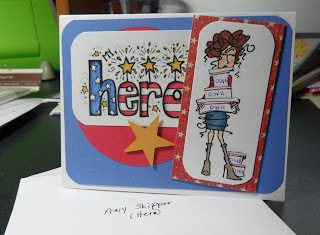 NOTE: I am not starting a scrapbook company (I have enough to do with OWH! 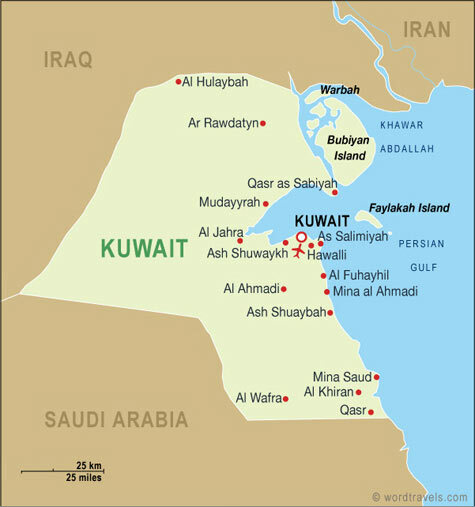 ), and this post has nothing to do with scrapping OWH. I am also NOT making anything off this consulting gig, and this is not for any scrapping manufacturer. If the project happens later, I'll tell you all about it - for now, I'm just doing research. You'd love what it's for, but I can't tell you that yet! A lot of folks on our Facebook poll the other day said they'd bought a lot of kits that included a lot of papers/items that they'd never use, so they now shied away from kits and just purchased things specific to their needs. But I'd like to figure out if there's something that would be helpful. I'd love the opinions of those who might be interested in scrapping something specific.....a kit for pages about an event or experience that you can't find materials for elsewhere. The kit would be all-inclusive, so you wouldn't need to purchase other materials for pages, but could always supplement from your stash. Some of the types of specific scrapping topics could be things like these below, though these are NOT part of the project I'm researching. I don't want to color your opinions with specifics of my idea, but these are the kinds of scrappy projects you might think of when answering the questions at the end. a personal perspective that you want to journal, perhaps your feelings on an issue, or the impact someone had on your life - pages would guide the journalling by prompting with questions to complete, photo ideas, etc. Perhaps some of you have wanted to scrap things like this, and wished materials were available. Please leave a comment with your responses to as many of these as you have opinions on. You might want to copy/paste the questions into the comment box. If yes, how much was in them? Enough for how many pages? What did it cost (approx)? Would you purchase a kit for something specific, like the examples provided above? What would you pay for a quality kit that had enough papers, stickers, and embellishments for about 5 or 6 pages? Thanks so much for your input, ladies....I appreciate the input! Feel free to link to this post in scrappy forums to see if your scrappy friends (not necessarily cardmaking buddies) want to weigh in too. 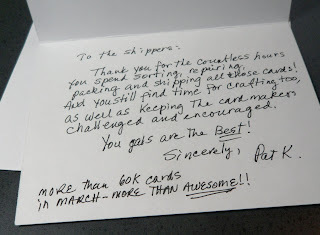 This week our shippers processed 7,680 cards! Woohoo our cardmakers ROCK! Keep on with the Dad cards - we'll be needing them for our boxes....if they say "Dad" or "Father" but not "Father's Day", they're the most flexible for both our shippers and for our heroes. See you at the OWHtv show tonight - 6:30pm Pacific on our Ustream channel! This week 4,820 cards were mailed out this week - at a cost of $212.35. It was back to a somewhat relaxed week for us, compared to recent shipping totals...a breather after the Mother's Day rush the last few weeks! recommendation to make her an honorary soldier. It's been a slower week of receiving cards...whew! After the Mother's Day rush, it was a blessing to have time to get all those cards packed up and out! Now we'll begin again, needing lots more cards of all themes for our Father's Day boxes - we'll be needing lots more in the coming month. You all rock! Remember for FATHERS DAY CARDS, if some of your cards for pop can just say "Love You Dad" or something, rather than "Happy Father's Day", it gives both our shippers and our heroes flexibility in when they can be used. You all did great on those Mom cards! GRAD CARD DEADLINE is this Friday - we already have tons, thank you! Tonight's OWHtv is going to include: STICKERS! Our Extreme Card Makeover session will show this beautiful butterfly on a series of cards and give you some ideas....the show is at 6:30 pm, live here on the internet. Here is the show LINK, plus the link to our tv channel is now on our homepage for you if you need to check it out later. We're having a BLOG SKIP this weekend featuring stickers! Come to the Stars and Stamps blog Saturday morning, 10am EST, and check out the 10 bloggers who are sharing some creative ideas for using stickers...then show us yours! Many many thanks to all these cardmakers who contributed 8242 cards this week! would be over 5 feet long!! 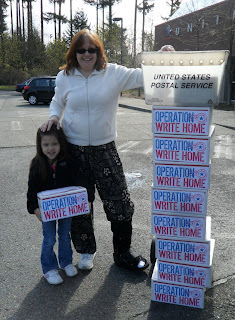 This week 16,027 cards were mailed out - at a cost of $643.00! These packages were a mix, mostly the large flat rate boxes, but a few flat rate envelopes of 60 Mother's Day cards for some of our units that we hadn't been able to include in their last shipment, so we played catchup. Many thanks to those who sent in the final Mom cards so we could be sure those units could write home for Mother's Day this year! April 15 - Graduation - read special notice! Yowwwwwwsa! Many many many thanks to all of you who sent in 15,478 cards this week! A special thank you to those who helped push us over the top with Mom cards, and those who redirected their packages to Kris to fill her requests from contacts. You ROCK!! PS Don't forget the OWHtv show tonight...we're debuting a new segment called "Extreme Card Makeover"....plus we just booked our first guest yesterday!!! (Stay tuned to watch at 6:30pm PST on ustream!